A Rock Can Be… by Laura Purdie Salas, illustrated by Violetta Dabija. Millbrook Picture Books, 2015. 32 pages. 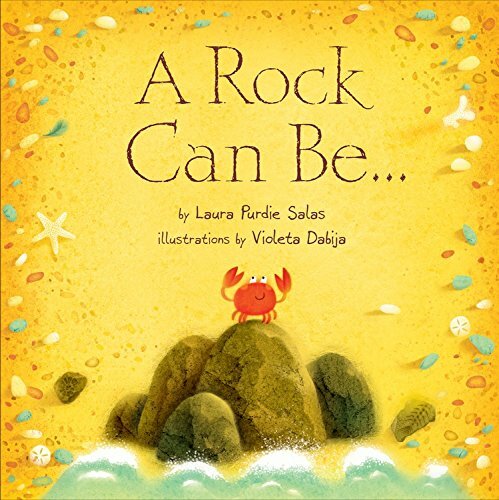 Salas and Dabija team up once again to bring us a child-friendly description of all the many things a particular item or substance can be: in this case, rocks! (Previous works have looked at water and leaves.) A Rock Can Be… contains much factual, scientific information about rocks and their various manifestations, ranging from diamonds to mountains. But rocks are more than fossils and sand; they can also be water skippers and help birds digest their food. Gentle text and illustrations in the main portion of the book are suitable for very young children and invite wonder at God’s creation. The end matter provides more scientific background for those wishing to learn more; a glossary and bibliography offer still more learning opportunities. In contrast to many books about rocks, there is only one mention of “millions of years” (in the description of how diamonds are formed). Creation is not mentioned either, but the book is very compatible with a creation worldview. A copy of this book was received via netgalley for a fair review. Cover image from amazon.